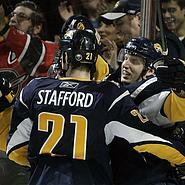 Thanks to an offensive surge, the Buffalo Sabres are making a run at a playoff berth. One game after posting an improbable comeback win, the Sabres will be trying for their fourth straight victory on Friday when they host the Toronto Maple Leafs. Buffalo (35-28-11) bounced back from a 4-1 deficit by scoring six unanswered goals in the third period of Wednesday's 7-4 win over Tampa Bay, the third straight game the Sabres have scored at least six times. "These games are always fun," said Jason Pominville, who had two goals and two assists. "I think we enjoyed it, I'm sure the fans enjoyed it, but it's not the way we wanted to win." The Sabres' offense ranks among the most prolific in the NHL with 3.14 goals per game, and they've outscored their opponents 20-7 during their winning streak. The offensive surge has come at a good time for Buffalo, which currently sits in ninth place in the Eastern Conference standings. The Sabres are just one point behind Philadelphia for the eighth and final playoff spot, but just one ahead of 10th place. Thomas Vanek scored three consecutive goals in less than 8 minutes Wednesday, including the winner with 6:46 remaining, and Jochen Hecht chipped in two goals and an assist. Ryan Miller made 15 saves in his 27th straight game and 69th of the season, four short of setting the Sabres' single-season record shared by Don Edwards (1977-78), Dominik Hasek (1997-98) and Martin Biron (2001-02). Miller is 11-5-0 with a 2.58 goals-against average in 16 career games against Toronto (33-31-10), matching his most wins against any opponent. Miller has won his last three starts against Toronto, including 1-0 at home on Feb. 13. The Sabres and the Maple Leafs are both starting a season-ending stretch of eight games against Northeast Division opponents. Toronto is in 12th place in the East, six points behind the Flyers. The Maple Leafs won for the third time in four games on Tuesday, beating the New York Islanders 3-1. Pavel Kubina scored the tiebreaking goal on the power play in the third period, and Kyle Wellwood also scored and had an assist. Toronto is dealing with injuries as it tries to stay in postseason contention. Mats Sundin, who leads the team with 32 goals and 45 assists, has missed the last two games with a groin injury and will likely sit out against the Sabres and on Saturday against Ottawa. Nik Antropov, who ranks second on the team with 26 goals and 52 points, has missed most of the last two games with a knee injury. He will be out at least for this weekend and likely longer.